I utilize a data driven statistical model/algorithm that I have developed called the 'FIGHT FORECASTER' and a combination of angles and trends to set my own true odds for each fight on a card. I then compare my line to the bookmakers odds to determine if there is any value in pricing. After isolating any fights with value I dig deeper into handicapping those fights by breaking down film. I also have a small team of consultants who specialize in certain aspects of the handicapping process who I compare my possible picks with. After all of the research, hours of breaking down film, and gathering of information I make my bets using a strict bankroll management system based on my perceived edge and the odds given. I am always tweaking my process. 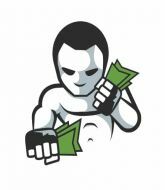 If my overall ROI ever dips below 0.00%, I will post all of my picks here for free until profit is shown and my ROI is back in the black. The price of my premium picks is only $5.00 each. This small fee helps to pay for my time as I spend over 40 hours per week handicapping fights. I will post strong leans for free. Usually at least 1 per card. Please spread the word and help get me more followers/buyers that way I will be able to keep the price low.